Big G Express, Inc., a Shelbyville, TN based truckload carrier, recently announced 5-Year Service Awards for outstanding truck drivers employed with the fleet. One of those drivers resides in Woodbury, TN. 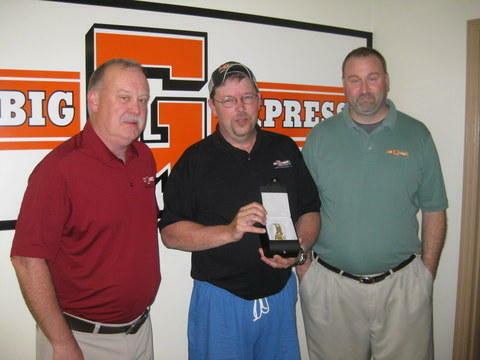 Kenneth Hieb started driving big rigs for Big G Express in 2007. His wonderful personality and attitude, exceptional service and hundreds of thousands of safely driven miles are an inspiration to all that know him. Big G Express is proud of all their fine truck drivers who work long and hard to safely deliver America’s cargo. Kenneth stands out among those drivers because of his years of dedication to quality customer service and safe driving. It’s because of people like Kenneth that BIG G EXPRESS has achieved its goal of being the best truckload carrier in the industry. THANKS, Kenneth, for going the extra mile! Good for him! As the wife of a truck driver, I am happy to see something positive said about a driver instead of the normal attacks in the media. I can't think of one thing we use here on the farm or elsewhere that isn't brought in by truck. So thank all of you truck drivers, my best friend is a trucker, and I know the sacrifice they make to bring in goods for us all to use. God Bless them all.